Aurum Cables UL Approved 6 Feet Universal Computer Monitor Power Cord , C13 Power Cable for Monitor, PC, Desktop, Printer, Scanner, 18 AWG NEMA 5-15P to IEC13 - 5 Pack by Aurum Cables at Pacs BG. MPN: LYSB01J4M3QDW-CMPTRACCS. Hurry! Limited time offer. Offer valid only while supplies last. Aurum Cables 18 AWG Computer Power Cord - 6 Feet - Black - 5 Pack(NEMA 5-15P to IEC-320-C13) Suitable For General Use! The Aurum Cables 1-ft. The Aurum Cables 1-ft. 18AWG, 10A Computer Power Extension Cord is the ideal simple and affordable solution for extending the length to your Desktop Computer, PC, Monitor, Printer, Scanner Etc with this 18Awg SJT NEMA 5-15P 3 grounded male plug on one end connecting into any grounded outlet power source and a IEC C13 3 conductor PC power connector socket on the other end connecting into your power device. Easily connect and replace or just get that extra length you always wished to have to extend the reach between your power source and Monitor, PC, Desktop, Scanners or any other equipment that uses the 3-pin power connector. The standard three-prong design allows use in almost anything, Such as TVs, speakers, stereos, game systems, chargers, computers, monitors, scanners, power transformers, printers and much more and pluging it into the satandard power outlet with a NEMA 5-15P on the other end! The Aurum Cables extension cord is a 18-gauge consisting of three-prong, grounded for safety. Providing highest quality with a Sturdy Long-Lasting Construction, durable vinyl covering insulating and protecting the cord's conducting wires, plus resists moisture, abrasion, and the damaging effects of sunlight. This cord is recommended for general indoor use. • Connector 1: SJT NEMA 5-15P 3 grounded male plug. • 18/3 -18Awg with 3 conductors grounded. • SJT - S = service, J = Junior, T = Thermoplastic/Vinyl. • UL Approved - meeting the required safety standards. 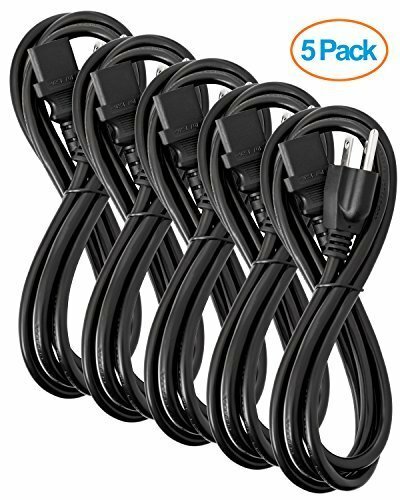 VALUE PACK: Valued 5 pack computer power cable to replace or to just add some length to your device by extending the reach of your power source to any equipment that uses the 3 pin power connection. SPACE SOLUTION: The ideal solution to maximize the usage of your computer desktop PC monitor laser printer scanner HDTV TV's projectors speakers LED-lit monitor by extending the length to your specifications through this short and a simple extender. COMPATIBLE WITH: This universal power cord is designed to work with almost anything with a three-pin power connection. Great for most TVs, computers, monitors, scanners, power transformers ,printers etc. by giving you a SJT NEMA 5-15P 3 grounded male plug on one side and a 3 conductor PC power connector socket on the other end. STURDY AND FLEXIBLE: Features a fully molded design that provides maximum durability and long life. SAFETY ASSURANCE: UL Listed with a standard NEMA 15-5-P grounded power plug to 3 pin power female IEC-320-C13 connector, cable type SJT 10A/300V rated.